What we do: Alaris Holdings Ltd is a leading global radio frequency technology holding group that invests in radio frequency related technology companies. The company’s strategy is to invest and grow the global radio frequency technology sector which operates in innovative bespoke products and solution design factories for clients that require this technology. The company has been listed on the on the JSE AltX since July 2008. Ownership & Management: The main subsidiaries of Alaris Holdings are Alaris Anthennas, COJOT and Aucom which are the main revenue drivers in the group. Alaris Holdings is 61% owned by directors and associates and 39% owned by public shareholders. The company is managed under the Chief Executive Juergen Dresel who has strong global track record in the radio frequency industry through his exposure to the defense technology sector which is a strong revenue generator for Alaris. Key financial indicators: Alaris designs and develops technical IP and manufactures in South Africa but sells 80% of its products overseas. 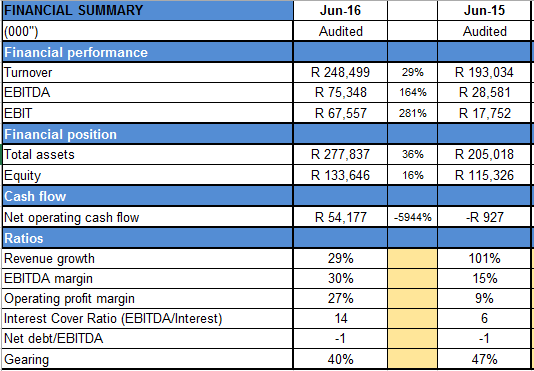 Revenue was up by 29% from R193m to R248m and EBITDA improved by 164% to R75m as at June 2016. The Group will strive to strengthen its strong position in radio frequency technology by investing in related technology companies and capitalize on synergies. 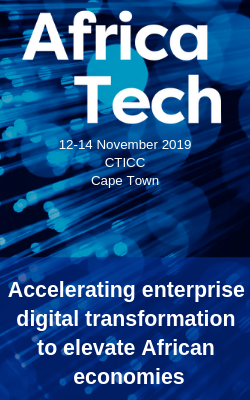 Track record: Alaris Holdings is a well-established radio frequency technology company that has 80% of its client base outside of South Africa (USA, Europe and Asia). Clients are system integrators, frequency spectrum regulators and players in the homeland security space.